That day alone sold me on synthetic for this specific project, and since picking SWG Construction as the synthetic contractor, their commitment and help has been nothing but first class. Southwest Greens International has announced a major construction project on the shores of Hong Kong. Headquartered in The Netherlands, Southwest Greens Construction is the official golf course construction arm for Southwest Greens International. 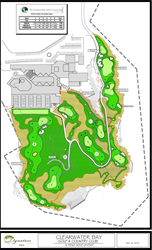 Southwest Greens Construction is responsible for all major golf course construction projects for Southwest Greens International, and as such has the most experienced installation and construction team in the industry. Southwest Greens International is a division of Shaw Industries. With a multi-million dollar network of 75+ franchise operations worldwide, the Southwest Greens organization is regarded as the undisputed Global Leader in the sales, design, construction and maintenance of synthetic golf solutions. The Southwest Greens product is the preferred putting surface for more than 40 professional golfers on the PGA and LPGA Tours including the likes of Jack Nicklaus, Annika Sorenstam, Jim Furyk and Justin Rose. A wholly-owned subsidiary of Berkshire Hathaway Inc., Shaw Industries is a full flooring provider to the residential and commercial markets. Shaw supplies carpet, hardwood, laminate, resilient, and tile/ stone flooring products, as well as synthetic turf. Shaw Sports Turf is one of the leading synthetic turf companies in North America and has represented quality and innovation for more than two decades. Shaw’s Turf division consists of Shaw Sports Turf, Southwest Greens International, Shaw Grass and an exclusive partnership with Watershed Geo.